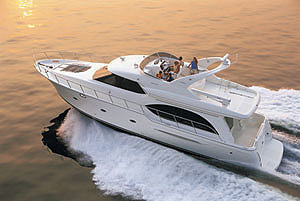 Mediterranean 38 Express: Made in America with world-class quality. Our Mediterranean 38 Express test boat turned smoothly and maneuvered with grace. "Made in the U.S.A." means a lot more to me today than it did two years ago, before September 11. Today, Americans rally 'round the flag like never before, and we have come to better appreciate the finer things our nation has to offer. All three models of Mediterranean Yachts — the 38 Express that is the subject of this sea trial, plus the company's 38 and 54 convertible sportfishers — are built right here in the good old United States of America. With so many boats on the market built in Europe or Asia, it is refreshing to find an entire line of Southern California natives. To be truthful, when I prepared to test an express cruiser, I didn't expect much more than a fast ride. However, I was mistaken — and very pleasantly surprised with the Mediterranean 38 Express. In this case, "American made" translates into solid design and a big value for your buck. This Mediterranean 38 Express is a well-thought-out and well-built yacht that is equally well suited as a family cruiser and a serious fishing machine. 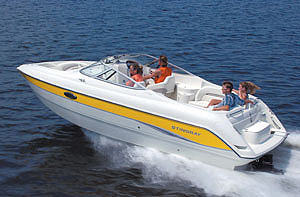 This boat is so impressively versatile that it will never languish in a slip. United Yacht & Ship in San Diego — the exclusive distributor for the Mediterranean 38 Express — provided our test boat, which was equipped with twin 430 hp Volvo Penta diesels (electronically controlled turbocharged six-cylinder TAMD74 EDCs). Jack Buckley, broker for United Yacht & Ship, said these are the largest powerplant options available on Mediterranean's 38 Express. Other diesels offered include quality twin-engine packages from Caterpillar, Cummins and Yanmar. Mediterranean Yachts is based in Santa Ana, California, and it has been in business at the same location since 1985. Mediterranean's partners John White and Richard Valdes take active roles in the design and production of their vessels. "We did a lot of research, to give the buying public a lot of boat in a 38-footer," White told Sea Magazine. "We didn't want to produce just another express." There's a world of difference between this 38 Express and the 38 Convertible model that comes from the same basic hull mold. On the day of our sea trial, typical "June gloom" overcast conditions were amplified by 10 to 12 knots from the southwest, but our tide was going to be high slack — so, the boat's windage would be the only significant difference in our uphill and downhill runs. Our test boat had a sleek arch and full canvas. We carried half a load of fuel and water, three adults and no skiff. 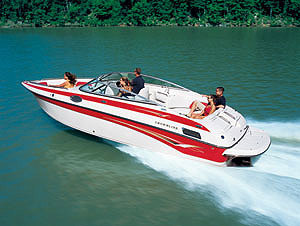 We noticed that the 38 Express' fiberglass swim platform is about 8 inches above the waterline. You can tell it was designed for West Coast boating. You enter the 8- by 10-foot fishing cockpit through a swinging transom door — just like on the bigger sportfishers — and the door section of the broad coaming flips up. I was impressed with the quality of this coaming — crafted with excellent material and stitching, with super-thick padding and a styroboard backing that can't drip brown gunk when it ages. The height of the cockpit sides is generous, for added safety. A handy 48-gallon bait tank is molded right into the transom, and two large fishboxes are molded in beneath flush deck hatches. One fishbox is refrigerated, making it equally useful for beverages. The 8-foot-wide lazarette hatch provides ready access to all the bait pumps, the boat's Hynautic steering gear, the sound-insulated 5 kw Northern Lights auxiliary generator and ample stowage. Carpeting lines all this boat's stowage spaces. A hot freshwater shower and two sets of hose bibs (for fresh and salt water) are conveniently provided in the cockpit. The tackle center has hot and cold water, a large cutting board top and lockable storage beneath. Nice chromed bronze corner fittings and ample rod holders ring the cockpit. The helm station and seating area are open to the action in the cockpit. A toe switch in the cockpit raises the entire forward deck, giving 10-foot-wide access to the engine room. This is not quite a stand-up engine space, but you can readily see and reach over the top of either engine. A man-size alley runs between the engines and athwartships forward of them, too, giving good access to beefy bronze sea strainers, twin Racor fuel filters, twin battery banks and the fuel system. The shafts are built of heavy 1-3/4-inch stainless steel — and Mediterranean uses the same big shafts with its smaller diesels. We checked our fluids, then took off on our sea trial, off San Diego. The 38's big Volvo Pentas are throaty, idling at about 1.5 knots, so Buckley slipped them in and out of gear to maneuver out of a tight slip behind the brokerage on Shelter Island Drive. After clearing the small boat harbor, we throttled up to 2,600 rpm. 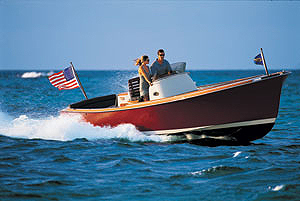 The big Volvo Penta diesels really moved this modified deep-V performance hull along. The boat was instantly responsive to the throttles, and we accelerated up onto a level plane very smoothly — and very quickly. In the straightaway, we reached a top speed of around 31 knots. 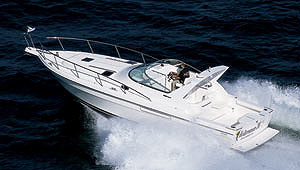 Visibility at high speeds is still good from the helm, bow trimmed down. The gap between the raked-back wrap-around windscreen and the Bimini top admits just enough air so that people gathered on the settee, to port, can enjoy the breeze without getting blow-dried. The running of the engines is not loud enough to make any significant impact on conversation at the helm — and belowdecks, it's even quieter than we expected. We found no loose-fitting drawers or doors, and no slack wiring bundles that could rattle or buzz while the boat is under way. Coastal waves and harbor wakes are dampened nicely by the hull's modified deep-V entry and forward quarter, so the ride remains stable. Crossing steep wakes was still comfortable, with no jerking motion to throw unsuspecting passengers off their feet. That's important, whether you're drifting quietly over a dorado patch or zooming back to port. Stainless steel rails around the foredeck and walk-around sidedecks are high — and Mediterranean has intelligently welded the stanchions into their bases, eliminating the chance for corrosion and dangerous wobble. This deck layout seems ideal for family cruising, but Buckley said custom modifications are possible — such as, perhaps, a second helm bench and tackle prep station instead of the large settee. The only thing I'd add is a grabrail above the side steps — something that is best left for custom fitting. At various rpm levels upwind and downwind, with and against the current, we did several speed, time and distance runs, along with a few maneuvers. Buckley pointed out that the unique tunnel design of the stern prevents propwash from soaking the shoes of anyone standing on the swim platform, because it is deflected aft, not upward. 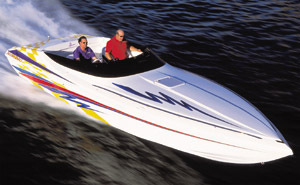 When maneuvering in tight quarters with our test boat's powerful engines, we were idling or in neutral. With any of the lower horsepower engine options, I would expect tricky docking maneuvers to be even easier — but this smooth power is addictive. Inside, the L-shaped galley features Corian counters with deep fiddles, an undercounter refrigerator, a ceramic-top range, a microwave oven and ample storage. The U-shaped saloon's settee and table showcase the same fine craftsmanship as is found on deck, but this settee pulls out to sleep two in comfort. The head compartment, with shower, is roomy and bright. The master stateroom has a double island berth, hanging lockers and more storage with mirrors. All deck hatches have screen fittings — important for cruising comfort. 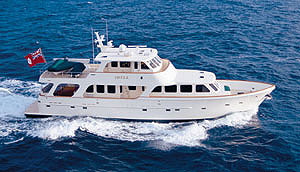 Mediterranean built lots of integrity and value into the 38 Express Cruiser. 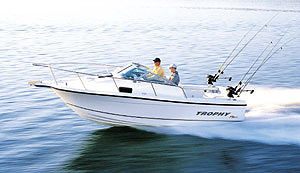 Whether serious angling or comfortable overnight cruising is your goal, this is a great boat for enjoying these activities to the fullest. Norcold 110v/12v refrigerator/freezer; two-burner electric range; hot and cold pressurized water system; electric marine head; 13-inch color television with remote amplified antenna; molded skid-resistant deck surfaces; anchor pulpit with bow roller; Bomar ventilating hatches; self-bailing cockpit with drains; two fulsh fiberglass fishboxes; Racor fuel filters/water separators; Tank Tender system. High-performance modified deep-V fiberglass hull; hand-laminated, high-tech stitch-bonded; biased biaxial and unidirectional fiberglass reinforcement; balsa core sandwich construction in sides; solid fiberglass bottom. One-piece fiberglass deck; balsa core-reinforced composite structure. Stainless steel rails with stanchions welded into their bases.